NavigationTiming (Level 1) is currently a Recommendation, which means that browser vendors are encouraged to implement it, and it has been shipped in all major browsers. NavigationTiming (Level 2) is a Working Draft and adds additional features like content sizes and other new data. It is still a work-in-progress, but many browsers already support it. As of April 2018, 94% of the world-wide browser market-share supports NavigationTiming (Level 1). Let’s take a deep-dive into NavigationTiming! How it was done before? If that’s all you’re interested in measuring, that’s fine, but there’s a large part of the user’s experience that you’ll be blind to. Phase 1-4 timings will vary depending on the network. 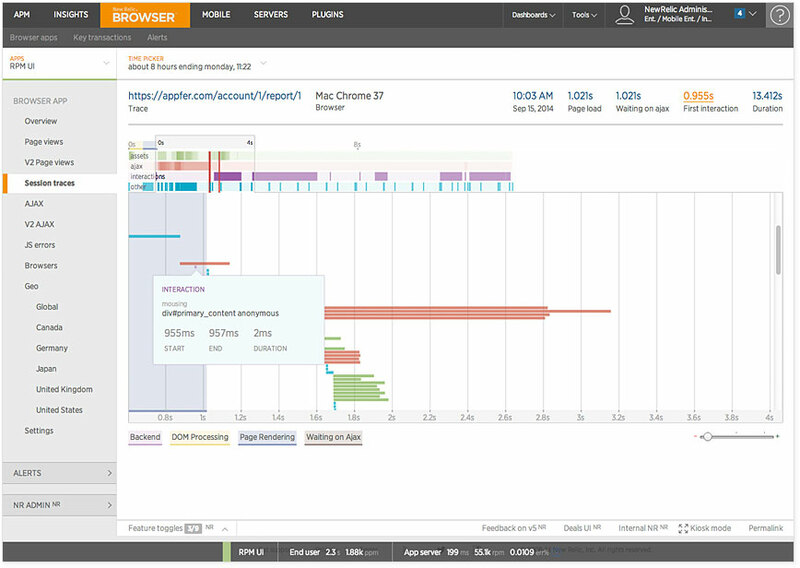 One visitor might fetch your content in 100 ms while it might take another user, on a slower connection, 5,000 ms before they see your content. That delay translates into a painful user-experience. What about #3? Why is Date.getTime() (or Date.now() or +(new Date)) not reliable? Let’s talk about another modern browser feature, DOMHighResTimeStamp. Why not just use the Date object? monotonically non-decreasing means that every time you fetch a DOMHighResTimeStamp, its’ value will always be at least the same as when you accessed it last. It will never decrease. sub-millisecond resolution means the value has the resolution of at least a millisecond. In practice, DOMHighResTimeStamps will be a number with the milliseconds as whole-numbers and fractions of a millisecond represented after the decimal. For example, 1.5 means 1500 microseconds, while 100.123 means 100 milliseconds and 123 microseconds. Each of these points addresses a shortcoming of the Date object. First and foremost, monotonically non-decreasing fixes a subtle issue with the Date object that you may not know exists. The problem is that Date simply exposes the value of your end-user’s clock, according to the operating system. While the majority of the time this is OK, the system clock can be influenced by outside events, even in the middle of when your app is running. For example, when the user changes their clock, or an atomic clock service adjusts it, or daylight-savings kicks in, the system clock may jump forward, or even go backwards! This can even lead to problems when doing statistical analysis of your performance data. Imagine if your monitoring tool is taking the mean value of operational times and one of your users’ clocks jumped forward 10 years. That outlier, while “true” from the point of view of Date, will skew the rest of your data significantly. DOMHighResTimeStamp addresses this issue by guaranteeing it is monotonically non-decreasing. Every time you access performance.now(), you are guaranteed it will be at least equal to, if not greater than, the last time you accessed it. You should’t mix Date timestamps (which are Unix epoch based, so you get sample times like 1430700428519) with DOMHighResTimeStamps. If the user’s clock changes, and you mix both Date and DOMHighResTimeStamps, the former could be wildly different from the later. To help enforce this, DOMHighResTimeStamp is not Unix epoch based. Instead, its epoch is window.performance.timing.navigationStart (more details of which are below). Since it has sub-millisecond resolution, this means that the values that you get from it are the number of milliseconds since the page load started. As a benefit, this makes them easier to read than Date timestamps, since they’re relatively small and you don’t need to do (now - startTime) math to know when something started running. DOMHighResTimeStamp is available in most modern browsers, including Internet Explorer 10+, Edge, Firefox 15+, Chrome 20+, Safari 8+ and Android 4.4+. If you want to be able to always get timestamps via window.performance.now(), you can use a polyfill. Note these polyfills will be millisecond-resolution timestamps with a epoch of “something” in unsupported browsers, since monotonically non-decreasing can’t be guaranteed and sub-millisecond isn’t available unless the browser supports it. So, how do you access NavigationTiming data? All of the performance metrics NavigationTiming exposes are available underneath the window.performance DOM object. NavigationTiming’s metrics are primarily available underneath window.performance.navigation and window.performance.timing. 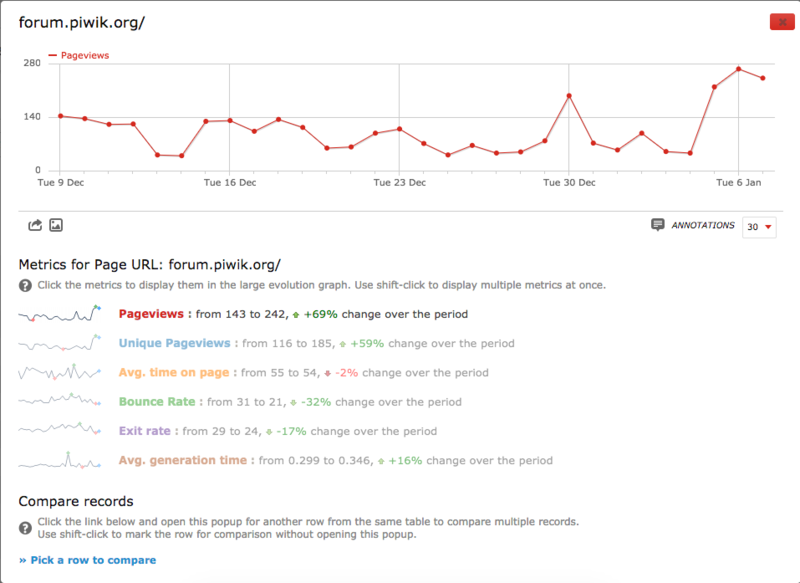 The former provides performance characteristics (such as the type of navigation, or the number of redirects taken to get to the current page) while the latter exposes performance metrics (timestamps). Note that each of the timestamps are Unix epoch-based, instead of being navigationStart-based like DOMHighResTimeStamps. This has been addressed in NavigationTiming2. The entire process starts at timing.navigationStart. This is when your end-user started the navigation. They might have clicked on a link, or hit reload in your browser. The navigation.type property tells you what type of page-load it was: a regular navigation (link- or bookmark- click) (TYPE_NAVIGATE = 0), a reload (TYPE_RELOAD = 1), or a back-forward navigation (TYPE_BACK_FORWARD = 2). Each of these types of navigations will have different performance characteristics. Around this time, the browser will also start to unload the previous page. If the previous page is the same origin (domain) as the current page, the timestamps of that document’s onunload event (start and end) will be filled in as timing.unloadEventStart and timing.unloadEventEnd. If the previous page was on another origin (or there was no previous page), these timestamps will be 0. Next, in some cases, your site may go through one or more HTTP redirects before it reaches the final destination. navigation.redirectCount gives you an important insight into how many hops it took for your visitor to reach your page. 301 and 302 redirects each take time, so for performance reasons you should reduce the number of redirects to reach your content to 0 or 1. Unfortunately, due to security concerns, you do not have access to the actual URLs that redirected to this page, and it is entirely possibly that a third-party site (not under your control) initiated the redirect. The difference between timing.redirectStart and timing.redirectEnd encompasses all of the redirects. If these values are 0, it means that either there were no redirects, or at least one of the redirects was from a different origin. fetchStart is the next timestamp, and indicates the timestamp for the start of the fetch of the current page. If there were no redirects when loading the current page, this value should equal navigationStart. Otherwise, it should equal redirectEnd. Next, the browser goes through the networking phases required to fetch HTML over HTTP. First the domain is resolved (domainLookupStart and domainLookupEnd), then a TCP connection is initiated (connectStart and connectEnd). 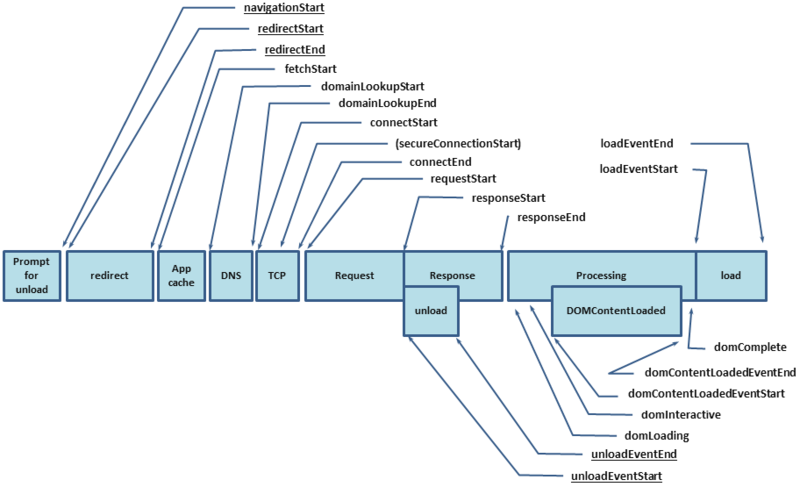 Once connected, a HTTP request (with headers and cookies) is sent (requestStart). Once data starts coming back from the server, responseStart is filled, and is ended when the last byte from the server is read at responseEnd. Note that the only phase without an end timestamp is requestEnd, as the browser does not have insight into when the server received the response. Any of the above phases (DNS, TCP, request or response) might not take any time, such as when DNS was already resolved, a TCP connection is re-used or when content is served from disk. In this case, the timestamps should not be 0, but should reflect the timestamp that the phase started and ended, even if the duration is 0. For example, if fetchStart is at 1000 and a TCP connection is reused, domainLookupStart, domainLookupEnd, connectStart and connectEnd should all be 1000 as well. secureConnectionStart is an optional timestamp that is only filled in if it the page was loaded over a secure connection. In that case, it represents the time that the SSL/TLS handshake started. After responseStart, there are several timestamps that represent phases of the DOM’s lifecycle. These are domLoading, domInteractive, domContentLoadedEventStart, domContentLoadedEventEnd and domComplete. domLoading, domInteractive and domComplete correspond to when the Document’s readyState are set to the corresponding loading, interactive and complete states. domContentLoadedEventStart and domContentLoadedEventEnd correspond to when the DOMContentLoaded event fires on the document and when it has completed running. Finally, once the body’s onload event fires, loadEventStart is filled in. Once all of the onload handlers are complete, loadEventEnd is filled in. Note this means if you’re querying window.performance.timing from within the onload event, loadEventEnd will be 0. You could work around this by querying the timestamps from a setTimeout(..., 10) fired from within the onload event, as in the code example below. Note: There is a bug in some browsers where they are reporting 0 for some timestamps. This is a bug, as all same-origin timestamps should be filled in, but if you’re consuming this data, you may have to adjust for this. msFirstPaint – Internet Explorer 9+ only, this event corresponds to when the first paint occurred within the document. It makes no guarantee about what content was painted — in fact, the paint could be just the “white out” prior to other content being displayed. Do not rely on this event to determine when the user started seeing actual content. The Level 1 interface, window.performance.timing, will not been changed for Level 2. Level 2 features are not being added to that interface, primarily because the timestamps under window.performance.timing are not DOMHighResTimeStamp timestamps (such as 100.123), but Unix-epoch timestamps (e.g. 1420147524606). Instead, there’s a new navigation type available from the PerformanceTimeline that contains all of the Level 2 data. As you can see, all of the fields from NavigationTiming Level 1 are there (except domLoading which was removed), but they’re all DOMHighResTimeStamp timestamps now. With access to all of this performance data, you are free to do with it whatever you want. You could analyze it on the client, notifying you when there are problems. 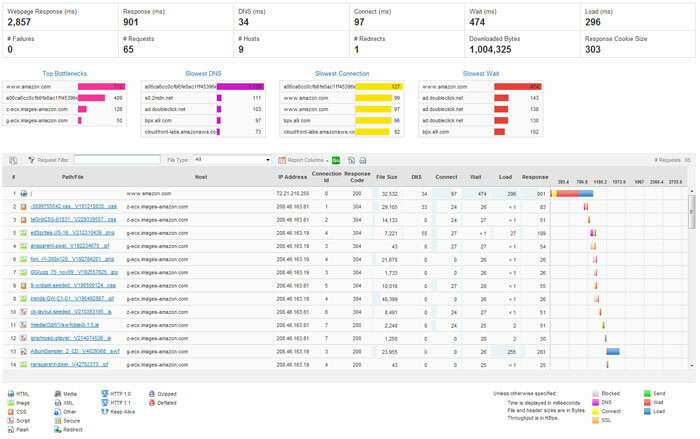 You could send 100% of the data to your back-end analytics server for later analysis. Or, you could hook the data into a DIY or commercial RUM solution that does this for you automatically. There are many DIY / Open Source solutions out there that gather and analyze data exposed by NavigationTiming. There are some great projects out there that consume NavigationTiming information. 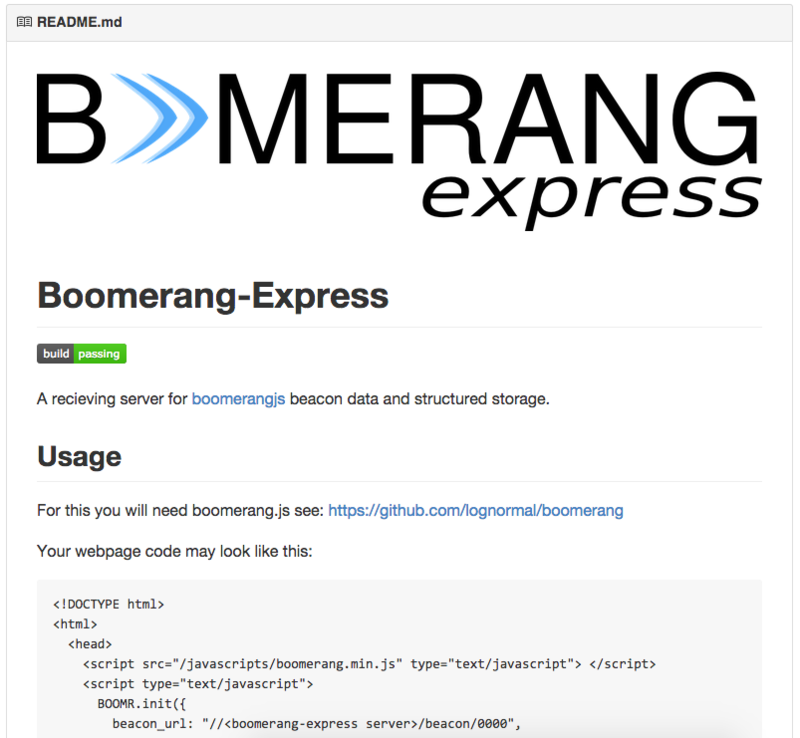 Boomerang, an open-source library developed by Philip Tellis, had a method for tracking performance metrics before NavigationTiming was supported in modern browsers. Today, it incorporates NavigationTiming data if available. It does all of the hard work of gathering various performance metrics, and lets you beacon (send) the data to a server of your choosing. (I am a contributor to the project). If you don’t want to build or manage a DIY / Open-Source solution to gather RUM metrics, there are many great commercial services available. There may be others as well — please leave a comment if you have experience using another service. NavigationTiming is available in all modern browsers. According to caniuse.com 94% of world-wide browser market share supports NavigationTiming, as of April 2018. This includes Internet Explore 9+, Edge, Firefox 7+, Chrome 6+, Opera 15+, Android Browser 4+, Mac Safari 8+ and iOS Safari 9+. Use fetchStart instead of navigationStart, unless you’re interested in redirects, browser tab initialization time, etc. loadEventEnd will be 0 until after the body’s onload event has finished (so you can’t measure it in the load event itself). We don’t have an accurate way to measure the “request time”, as requestEnd is invisible to us (the server sees it). secureConnectionStart isn’t available in Internet Explorer, and will be 0 in other browsers unless on a HTTPS link. If your site is the home-page for a user, you may see some 0 timestamps. Timestamps up through the responseEnd event may be 0 duration because some browsers speculatively pre-fetch home pages (and don’t report the correct timings). If you’re going to be beaconing data to your back-end for analysis, if possible, send the data immediately after the body’s onload event versus waiting for onbeforeunload. onbeforeunload isn’t 100% reliable, and may not fire in some browsers (such as iOS Safari). Single-Page Apps: You’ll need a different solution for “soft” or “in-page” navigations (Boomerang has SPA support). NavigationTiming data may not be perfect, and in some cases, incorrect due to browser bugs. Make sure to validate your data before you use it. Firefox: Reporting 0 for timestamps that should always be filled in, such as domainLookup*, connect* and requestStart. If you’re analyzing NavigationTiming data, you should ensure that all timestamps increment according to the timeline. If not, you should probably question all of the timestamps and discard. NavigationTiming exposes valuable and accurate performance metrics that were not previously available to your web app. If you’re interested in measuring and monitoring the performance of your web app, NavigationTiming data is the first place you should look. Updated 2018-04 with more NavigationTiming2 information! Can I still rely on performance.timing.navigationStart to provide the timestamp as to when the page navigation began or is that being deprecated? The docs here state its obsolete now: https://www.w3.org/TR/navigation-timing-2/#sec-PerformanceNavigationTiming. If it is obsolete, what can I use in its place to provide an equivalent timestamp? @Fred – At this point, all browsers still maintain performance.timing.navigationStart, even though it’s marked as obsolete. They’re supposed to provide performance.timeOrigin instead, though in some cases I’ve seen the two numbers differ, and it’s not clear to me why that would be. the check you have passes in FF(52) but then the getEntriesByType call yields undefined. True! Good idea to check the interface. Thanks, Nic for this article. It is really helpful. Is time to interactive (TTI) = performance.timing.domInteractive – performance.timing.navigationStart? How to detect if a visibility of the document has changed from `prerender` to `visible` for each navigation / soft SPA event? 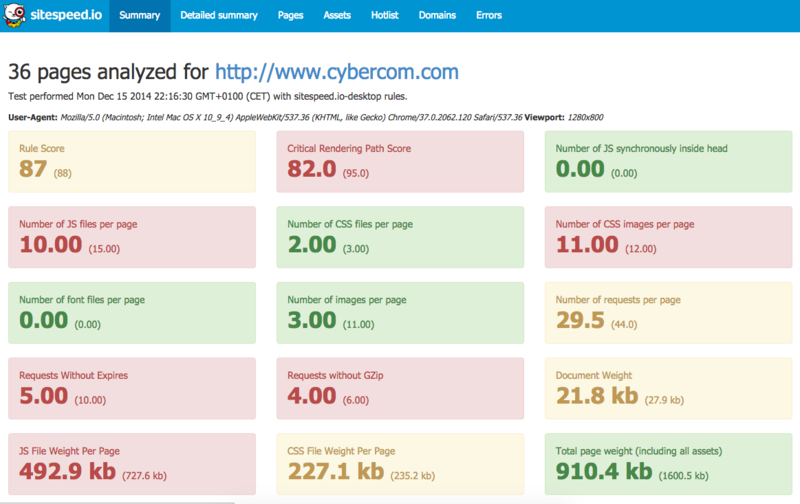 @Samar You can use the Page Visibility API (https://w3c.github.io/page-visibility/) to get the current visibility state, so if your script is on the page, you can log these transitions.